Planned Parenthood is yucky. I hate that they exist. I hate that they use lies and doublespeak to prey upon the most vulnerable among us (the women AND their babies). I was not one tiny bit surprised by the latest Planned Parenthood scandal. Sad, yes. But not surprised. However. Every time there’s another of these scandals, my Facebook feed fills up with calls to boycott. 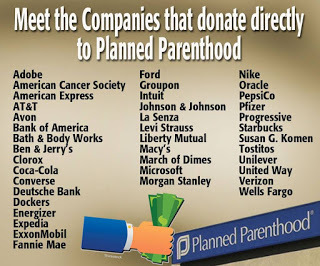 This time it’s “Forty Companies that Donate Directly to Planned Parenthood.” And, while I want Planned Parenthood to die just as much as the next gal about to give birth, (update: birth given, it was a doozy) I won’t be participating in this or any other boycotts of this type. It’s Planned Parenthood’s fault . . . apparently they lie about what a baby is AND who donates to their organization. But 2nd Vote and the folks circulating their boycott are currently maligning some companies who don’t deserve it. I have a problem with that. If we claim to have Truth on our side, we have a greater responsibility to get this kind of thing right. The Daily Signal has actually contacted the companies on the list and asked them about their corporate support for Planned Parenthood. While certainly in some instances there IS direct support, in a number of cases (Xerox, Coca-Cola, Fannie Mae, American Cancer Society, and Ford Motor Co.) it flat out wasn’t true. Then, for many of the companies, donations only occur as part of an employee charitable donation matching program which allows employees to donate to any approved 501(c)(3) organization. While -again- I abhor Planned Parenthood and everything for which they stand, that seems to me like a reasonable policy for companies to have. Charitable giving is GOOD. We want people to do it. We want companies to encourage it. But if we demand that companies have moral standards for charities to which employees may contribute BEYOND just qualifying as an official charitable organization . . . well, who gets to decide what is offensive? If *I* want true freedom of conscience and freedom of religion, if *I* want to be allowed to donate to organizations that *I* deem worthy based on my personal morals . . . I have to allow others that same freedom. That’s the way freedom works. That’s the way free will works. Sometimes it’s a stinker. I don’t get why the personal convictions of the CEO of a major corporation are a part of my business transactions with his company. If I call to hire a guy to come fix my air conditioner, I don’t ask him where he stands on gay marriage or abortion. I don’t ask him about his personal charitable giving. But then, somehow, people think that folks who run big companies should be punished for not living out my values. I get that it’s absolutely horrifying to think of even one cent of my money going to support causes that I am so deeply against. But that’s not what’s happening here. This is me giving my money to a person or company in exchange for goods or services. Then that person or company is choosing to do as he wishes with his own money. I’m not going to stand at the truck, giving the ice cream man a list of things on which he may not spend this two dollars I’m about to give him in exchange for a chocotaco. Right? What really got me thinking about all of this, was way back when, when folks on the other side called for a boycott of Chick-fil-a and got the CEO of Mozilla fired. It seemed really unjust to me, that people would try to rob someone of his livelihood because they hold different beliefs . . . even on something very, very important. I don’t want to be like those guys. I want to treat others the way I’d want to be treated. For me, it comes down to this: we DO NOT live in a culture that lives by our Catholic moral compass. We are the minority. We are missionaries in a pagan land. I honestly can’t see how boycotting is our best move here. We need to meet people who don’t understand the truth with friendship. We need to engage them in conversation. We need to be understanding. We need share The Truth with them. We should absolutely shine a light on evil that wants to hide in the darkness. But once we’ve done that, wouldn’t we be better off fighting the evil with love and compassion, rather than threats and bullying? This is a personal decision. You’ve got to inform your conscience and then follow it. I’m not here to say you must have a Pepsi in one hand and a Starbucks in the other, while eating Ben & Jerry’s and Tostitos and wearing Levi’s and Chuck’s or the terrorists win. It’s your money. All I want to suggest is that we figure out what our goals are. And then figure out if sweeping, social media-based boycotts are the best way to reach those goals. *I’m* thinking, no. update: Hastily organized, un-researched, social-media-besed boycotts like this one, I think do more harm than good. But, I don’t mean to imply that boycotts are never useful or effective. I'm curious – we don't have Planned Parenthood here in the UK (that I know of! ), so I was wondering what it is about their stance that you as a Catholic (or just as an individual! I'm not sure!) find so abhorrent? From what I just read on their website – which I appreciate is probably just spiel and does not necessarily reflect the whole truth of their organisation – their main aim is to allow every person a choice in how they control their own fertility. Obviously I know this goes against your belief as a Catholic, but as you mentioned above, not everyone shares your beliefs on this matter. Surely, for those out there who don't, it's good to have an organisation that helps them to explore their options when it comes to something as important as bringing a child into the world? Is it the entirety of WHAT Planned Parenthood actually do that you object to, or is there something in their policies/something that they have done previously that you don't like? Like I said, I'm just intrigued as to where you're coming from. It's difficult to find reliable statistics on a topic as emotionally charged as abortion, but whatever they'd like to convince you of otherwise, that is the focus of Planned Parenthood's operation: providing abortions. The latest scandal in which they are involved is multiple high ranking employees being caught on tape offering body parts of aborted babies for sale for research, which has been unsettling for people on both sides if the debate. I do not believe that Planned Parenthood has the best interests of women or families at heart. Hey Lauren! Thanks for engaging in this topic so respectfully. I just wanted to point out that we, as Catholics, are not against "Allowing every person a choice in how they control their own fertility". Just that there are practices and medicines we believe don't respect the life and dignity of the mother, father and child. That there are things PP takes part in that does not give a mother or her child "a choice" – i.e. while PP claims that abortions are a very small percentage of their business they've been taped on numerous occasions pushing abortion as the main "choice" over adoption or helping the mother receive financial aid or job training or education. We also believe in helping people control their fertility when necessary, but not through chemical and hormonal medicines that require a woman to put her health at risk to do so (increased chances for cancers, complications, etc.). It's not that we don't support choice when it comes to bringing a child into the world, it's just that our "choices" and PP "choices" do not allign. We believe strongly – and run our own maternity homes, adoption placement services, etc. – that there are better choices that allows both the mother and the child a good, respected life. I used to support PP in my younger days, but reading on the writings of PP founder Margaret Sanger and her support of racial eugenics and the statistics about the number racial minority communities "served" by these clinics swayed my mind about whether or not it was actually doing good (long before I was swayed the idea of life begins at conception). The website "Feminists for Life" gave me a lot to think about and consider on the topic of PP/abortion support. That said, I've never been a huge boycotter but with the momentum against PP right now I think just that threat could have a huge effect on PP funding and in my mind, that's a very very good thing. Thinking more on this this morning…I guess part of it is what you see the goal of a boycott being. If it's always to effect the exact change you want (an immediate demise of PP) then no, they're not always going to meet that goal. But I see part of the goal of a boycott as raising awareness and personal accountability. For me, I see this particular effort doing both…this very post being evidence that PP's behavior (and others being complicit in that) is being made more well known. I'm not big on boycotts myself. … Except. I have to make an exception for charities like Susan G. Komen or the March of Dimes. Similarly, the March of Dimes purports to stand for ending premature birth, infant mortality and birth defects, and to me that makes their alliance with PP especially troubling, for what I'd think are obvious reasons. So in short, my stance is: if a private company wants to do something I hate with my money, I can't really help that. But if a charity is going to take my money and turn around and directly donate it to a cause I hate, that's also completely counterproductive to the cause they claim to stand for, that's another ball of wax. I also make the Susan G Komen exception, but, to be honest, I think that's a little different than boycotting, say, starbucks. Susan G Komen has a seeming 'partnership' with Planned Parenthood. That's just different in my mind. Agreed. We also don't support charities that support abortion. Charities in general are just different. We thoroughly research the charities we support. I am giving my money to them for the purpose of helping others. I really think it's important to make sure that money is not actually hurting others. But I don't give money to Starbucks, Coca-cola or Ford so that they can do good (or in some cases bad) for women. I give them money for goods that are unrelated. I agree with you. Only a handful of boycotts have worked (South Africa and apartheid, Nike), and most tend to be more directed than this one — usually addressing a behavior or action that is more central to a company's operation, like how they make their shoes or where they are hiring labor from. Even if, say, Pepsi is donating money to PP, I doubt it's more than a tiny fraction of a fraction of a drop in the bucket of their revenue. This is NOT a central facet of their business plan. So getting a bad rep to stick to them based on that is going to be tricky, I think. Also by targeting 40 companies you actually dilute whatever intention you have with the boycott. Who can remember all 40? The huge number in essence makes it seem more commonplace and less scandalous. Also, I saw this article about boycotts. Thought it was interesting. That article is really interesting. It makes a compelling point about how to actually effect change. I have to agree with you, Kendra. While I am very much pro-life, there's only so far that we can take our boycotts before we cut off our noses to spite our faces. For me, there are charities and organizations I avoid supporting if a company is having a special fundraiser for the organization (sorry I'm being so vague, just don't want to seriously offend other people on the blog). Your point about hypocrisy made me think about how it's like in my area, where people display their faith in God and Jesus on their sign for their business. As a fellow believer, I'm glad they're part of the community of Christians, but as an average Jane, all I care about is whether they'll do a job worthy of their profession. When my dishwasher explodes, the last thing I want to be doing is asking, "So I know you've been doing your job for 30 years, but do you believe exactly as I do with regards to doctrine?" This post also made me think of this article I read a while ago. That article is great. She had me at the Bad Cop photo. Oh my gosh, that made me so mad! I haven't been successful at totally boycotting the 'bucks either, but I definitely spend way less money there than I otherwise would. 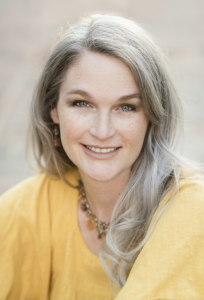 Kendra, thank you for the thought-provoking post! I’m so glad that we have a place to rationally hash out ideas!  When dealing with the whole boycott issue, I try to remember what one of my friends once told me: money is a form of power for us. We can choose to put our money where we want, and in that, we support different things. For example, I really like supporting local businesses, so I would much rather find a local restaurant to support than a big chain. I’m not going to hound every business I enter about where they donate funds to (even if it just comes in the way of matching funds), but I try to support places that give money to good causes, instead of supporting places that openly give money to bad causes. Some of our recent popes have talked about the economy, which I find quite interesting. While he doesn’t specifically address boycotting, Pope Benedict XVI, in “Caritas in Veritate,” writes that: “Locating resources, financing, production, consumption and all the other phases in the economic cycle inevitably have moral implications. Thus every economic decision has a moral consequence.” Now, I have to confess, I have not read Caritas in Veritate in its entirety. I only looked it up because Pope Francis cites it in “Laudato Si,” when he talks about boycotts. Pope Francis doesn’t talk about boycotts in relation to the Planned Parenthood issue, but more in a general environmental way. In “Laudato Si,” he shows that we wield power in where we put our money. He writes: “A change in lifestyle could bring healthy pressure to bear on those who wield political, economic and social power. This is what consumer movements accomplish by boycotting certain products. They prove successful in changing the way businesses operate, forcing them to consider their environmental footprint and their patterns of production.” I think it's cool how these two popes talked about how we need to integrate our Faith into every aspect of our lives, even our financial aspects. Personally, I try to give money to non-PP supporters if I can. So I drink Coke instead of Pepsi. It’s not hard, it’s something easy, and it’s a good way to put my money towards a company that reportedly doesn’t support PP. Again, thank you for starting this discussion, and thank you for your wonderful blog! I totally agree that money is power and deploying it thoughtfully can send a message or change things in the world. But I wonder what the message is that we're sending when we are boycotting companies with very tangential connections to the thing you dislike? There seem to be more focused ways of effecting change. Also, I would argue that if you knew most corporate practices inside and out, you would find it hard to purchase anything from anywhere. Industrial agriculture systematically mistreats is workers. The textile and apparel industry severely underpays and overworks its employees and forces them to work in firetrap, unsafe conditions. The car industry sources many of its products from China, which holds a one-child policy. And on and on. It just seems like people have finite bandwidth to spend on limiting their remote cooperation with evil in purchasing decisions, and wasting that bandwidth on an ill-focused boycott campaign can actually do harm, because it means they're spending less time making focused efforts that can be effective. Thanks for your thoughtful comment! I think you have a good point, that there are more focused ways to bring about change. Personally, I have found that not supporting certain companies is a small thing that I can do to keep my money away from PP. But you are absolutely right, there are much bigger things that could probably be done to bring awareness and change. Haha…yes, it's really sad that there are so many deplorable conditions and issues with different industries!I I don't think the whole "boycott ALL the things" can be good, because it IS time consuming. And we can't live in caves and eat only bugs. So I try to pick one issue and focus on that (so I go with abortion-related stuff). Otherwise, I'd probably get overwhelmed and exhausted for no good reason. I don't know about you, but I feel that oftentimes, we get overloaded with causes, to the point where nothing gets done! Instead of actually doing anything, we hashtag and post articles about every single issue in the world, to the point where we're guilt-tripping ourselves for every Wal-Mart trip! 80% of charitable giving is by individuals. It's easier to boycott, but won't ever achieve meaningful progress on this issue. It's time to do the hard work of changing minds. But it's worth noting that in a country with universal healthcare, there's no PP. Why? Because an organization can't say "services for the poor!" "Mammograms!". Either they say they're an abortion group, change, or shut down. Yes, but that may also mean that the universal healthcare will include abortions. It would be very difficult in such a case to target just abortion for opposition; we might have to target entities that actually DID offer the bulk of the county's mammograms, for example. I agree with your thoughts here Kendra. Boycotts have a time and impact in some instances, but with large corporations such as most of the 40 listed, the real impact of their charitable giving gets into really murky water, really quickly. My husband works for a large corporation of the red, white and bullseye variety, and while as a corporation they donate to organizations that we don't support as Catholics, they also donate a similar if not equal dollar amount to those organizations we DO support as Catholics. It's how they stay afloat in the political waters, and how they maintain good PR with their own employees. Now I haven't studied every Fortune 500 company's financial report to know how skewed or equal the numbers are, but as you state in your four points above, I don't feel called to do that in order to live my Catholic faith in good conscious. Plus, I often think of Mark 12:41-44, and how that may translate into corporate giving verses the tithing and charitable giving my family does. I pray my family can be as generous as the Widow who gave all, because, really, that's what *I* am called to do. And Lord help us if we are ever in a position of needing to decide what a large corporation must give and where. This is what I've been feeling too, and you put it into words, so thank you! That, and if we boycotted every company that did something that we disagree with – well, then we'd pretty much be bartering and trading chickens for flour and furs at the trading post, because we couldn't shop anywhere. I feel maybe boycotting is not always the right approach, but what about making a concicious effort to give to businesses and individuals that we know are good and moral. Instead of looking in the yellow pages for someone to fix our air conditioner why not look to the sponsor companies in our church bulletin or ask a friend for a reference. Jackie, I love your idea of going to sponsors in the church bulletin! Or just going around your parish. I've noticed that when you start looking around in your parish because you need to hire a handyman or seamstress, you build a lot of bridges, strengthen community, and evangelize to other Catholics. Yes, I love the idea of flipping this to a positive action instead. 2) I realize #1 is a bit of a false equivalency, but I think it still illustrates the point because the reality is that because everything is so connected, if we boycotted EVERY company that gave money to morally objectionable things (even if we only limited ourselves to right-to-life issues), we would find ourselves unable to adequately care for our families. 3) People have brought up charities, which I agree is completely different. As Kendra said, the primary reason money changes hands in a commercial transaction is the trade of a good or service. What they will do with that money is secondary. With a charity, the primary reason money changes hands.is specifically because of what they will do with that money; in business it's the secondary concern but in charity it's the primary concern. 4) Abortion specifically is an individual choice, so we can still encourage a culture of life through other means even if some of our money filters its way to Planned Parenthood. 5) Those companies do lots of other morally licit things with their money, such as buy product, pay employees, and many other things. All that being said, I'm glad to know the situation isn't as dire as all those 40 companies purposefully donating money to the cause of Planned Parenthood. Frankly, Starbucks coffee is the only coffee that doesn't make me nauseous. Oops – for #1, I meant to say that I am choosing option (a) because option (b) would sacrifice my kids' nutrition. Thank you so much for writing this post! 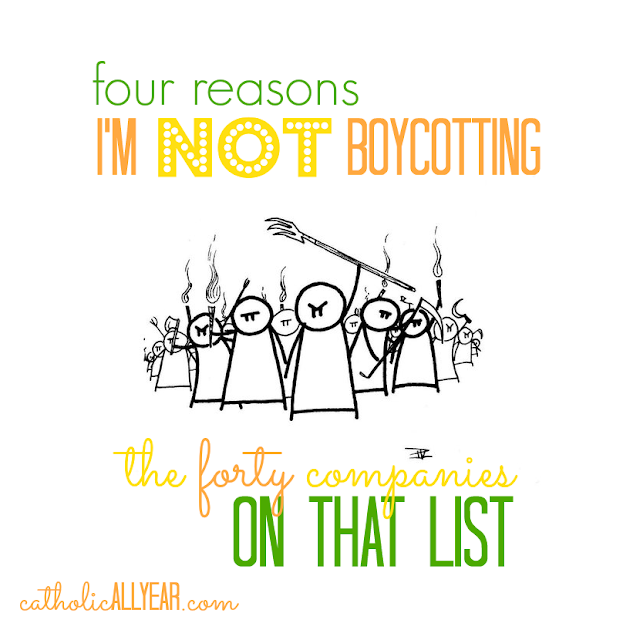 I felt a little guilty for not boycotting the companies on the list. Your reasons make perfect sense. I wrote a similar post a few years ago and man I got some NASTY comments…but I survived..my skin has gotten thicker. But you said it way better than I did. A bunch of people told me I needed to buy food/produce from the local farmers and I need to ask them what kind of donations they make before making my purchases and like you said that is really rude and not a good idea. 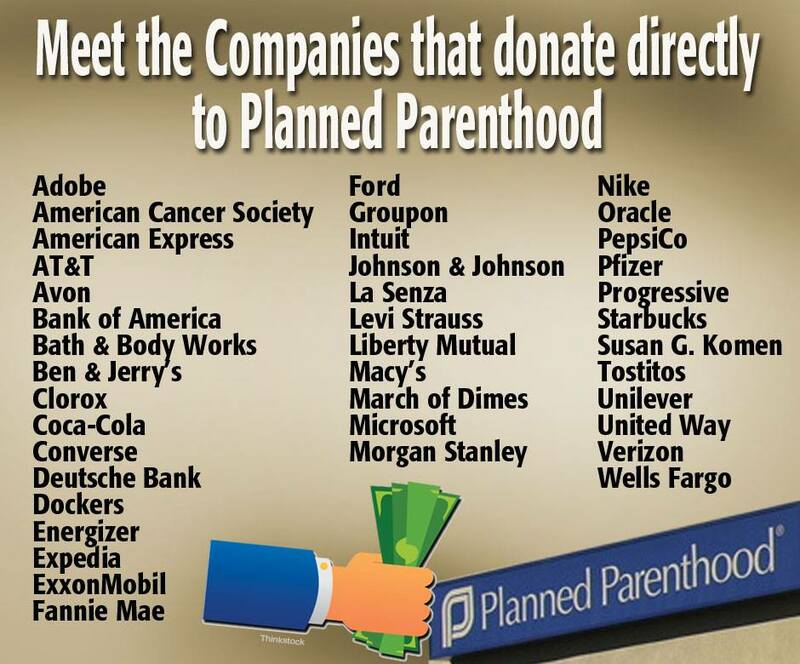 The other thing I thought is many of these companies really are only donating probably 1% of their profits to Planned Parenthood or whatever organization you don't like and out of your $100 purchase really that isn't all that much so you boycotting isn't really hurting them. I agree we live in a pagan world and need to find a better way to evangelize our beliefs than boycotting companies. Thanks for this well thought-out post. I have always felt a bit guilty for not boycotting whatever the bad business of the month was. But have also felt like it probably wasn't very effective. So I agree with you fully, thanks for thinking this through for me! So speaking of boycott, I have a question on a matter that has, on and off, troubled me: how does one buy clothes (and other various items) from companies that do not treat their workers well (e.g. sweat shops) and not feel guilty? If I'm really honest with myself, I know I keep buying from them because 1) I don't want to go to the trouble of finding ethically sourced goods, 2) I like the level of comfort I can afford by turning to these relatively inexpensive companies, and 3) I sometimes just really like new things. But I am pretty sure on the other side of the world there is some mother who has hardly any time for her own family because she is making clothes/party favours/etc. for mine, earning a wage that can hardly get food on the table. Just something I struggle with sometimes, though probably not as often as I should. I think there's an app you can use to identify companies that make their clothing a little more ethically. Not all of the brands are fancy or high priced. Here's an article I found bout those apps, but I haven't tried any; I just mainly don't buy a lot of clothing and hope for the best. This is a difficult area where I don't think there's a great answer. The ugly reality is that people work these sweatshop jobs because they are the only / best jobs available. In places where well-meaning fair labor regulations have removed sweatshop work as an option, prostitution (especially child prostitution) skyrockets. I enjoyed the article a whole bunch!!! I have to admit, and now I feel a little silly for having done it, but we have avoided signing the kids up at our local Boys and Girls Club. The reason is the same, they donate money directly to planned parenthood. I don't know how much, need to do some sleuthing, but I've told the older kids we are not signing up for this or that, and just about every sport is through them because they support abortion, and the kids understand. While I do not let my younger kids know what abortion is,I like to save their innocence but my olders know. Ya know, I think this is a good opportunity to actually do something meaningful. If you, as an actual potential customer, call and ask to speak with the director of that location, and say you'd really like to sign your kids up, but you've heard that they donate to Planned Parenthood, and ask, Is it true? And if it is, What's the nature of the donations? And Why would they choose Planned Parenthood when to do so would put families like yours in the difficult situation of having to choose quality activities for their children or their convictions against abortion. I really think a conversation like that has the potential to affect change at a small, local level. No matter what answer you get, I don't think you are morally obligated to boycott the organization. It might be that by joining and getting involved you'd be able to get to know people in a position to make decisions at a local level and help affect change locally. Or maybe you find out that another organization makes better decisions with their donations already and you take your business there. I think either way is morally acceptable. I think that is sound advice. There are so many avenues to affect change, and staying in a hobbit hole is not one of them. Kendra, I give you my thanks for nodding me in a good direction. The question of morality is specific and important. Can we knowingly contribute money to an organization which directly funds an abortion provider? If you can't answer yes with a clear conscience, then you shouldn't. A good question to ask is always: What decision would you make if you knew you were going to die tomorrow? I agree and disagree. It's not black and white. Context is key. When I boycott, it is generally a private decision to withhold money from an organization that directly funds or promotes evil. I am not consistent but I think those small decisions make a difference, if not in the larger corporate context, at least in the development of my own conscience. It is similar to periodic fasting. If I want a Pepsi and have the opportunity to buy one with no one else around to see me, I can offer up that sacrifice for the victims of abortion… and also withhold the measly buck from PepsiCo. Is it "effective" to boycott that way? I don't suppose it is if one means that it will change the direction of the company. But as consumers, we shouldn't separate our moral lives from our purchases. I compromise all the time to satisfy my preferences. But a list reminds me of my charge to be a good steward of resources. It's a kick in the pants. Reminds me that "Yeah, it's a pretty darn big deal that anyone at all donates money to the cesspool that is Planned Parenthood." And that I don't want to be a part of it. The world doesn't care about those little sacrifices but I imagine Jesus does if they are offered with pure intentions and a spirit of reparation. Well said, Melody. I agree. I'm a little late to this party, but I just discovered your blog via a link someone shared on Facebook, and have been bouncing around to different posts you've done, and just found my way to this one. Overall I agree with your sentiment, but with one asterisk. While the convictions of a CEO aren't particularly relevant to my choice to do business with a company, what the company does IS relevant. So, I'm not inclined to boycott a company because its CEO (or employees, or whoever) decide to donate some amount of money to immoral causes, even if that donation is facilitated by the company. I'll even overlook cases where it's the company itself making the donation. One thing I can't overlook, though, is when the company itself is used as a tool for promotion of certain causes. Examples of this may be when companies issue press releases in support of causes, or when they bill themselves as key sponsors of something (parades, legislation, etc). At that point, the company has crossed a line that I'm not comfortable supporting. Bravo, Kendra! Thank you so much for this WISE post on boycotts. It really helped ease my conscience. I mean, if we *really* knew where every dollar goes at every business we do business with, we'd not be able to go anywhere, buy furniture, wear clothes, brush our teeth, eat out, drink anything etc. Thanks again. God bless you and your lovely family! JMJ we love you, save souls!